Freezing temperatures and scarce food make winter a challenging time for most animals in the wild. Raccoons combat these challenges through a series of physical and behavioral adaptations that keep them fed and warm through the cold months. Their extremely adaptable behavior makes them well suited to challenging climates. Raccoons are omnivores, gaining nutrients from plants, animals, eggs, insects and human items such as food from garbage cans and small livestock. This ability to use any food source serves these animals well in the winter when many types of food are scarce. They typically make up their winter diets with acorns, corn, fruit, insects, crippled waterfowl and small animals, although they will take advantage of any local food source that presents itself. Raccoons also combat starvation in the winter by building up fat stores in the summer and autumn months. Over the course of the winter, a raccoon may lose between 14 and 50 percent of his body weight depending on how far north he lives and the severity of the winter, making those extra pounds from summer essential to his survival. The fat builds mostly heavily in the tail, which may help the raccoon stay warm by wrapping it around himself in the cold. Raccoons also seek out warm dens in the winter to help protect them from the elements. They most commonly seek out hollow trees, but are opportunistic about other options. Raccoons have been known to take over the underground burrows of other animals, use caves or make dens in abandoned buildings to keep warm. They sometimes den with other raccoons as well to take advantage of the mutual body heat, especially in severe winters. Much like some animals go into hibernation, raccoons will enter a state known as torpor in the winter. While this is not true hibernation, the raccoon can sleep in a curled position in his den for weeks, significantly lowering the amount of energy he needs to survive. His body temperature lowers and increased insulin production decreases his blood sugar. On warmer days, the raccoon will wake up and spend some time foraging for food before returning to his den. This gives the small mammal many of the benefits of hibernation, while still keeping him alert to predators and potential food sources. 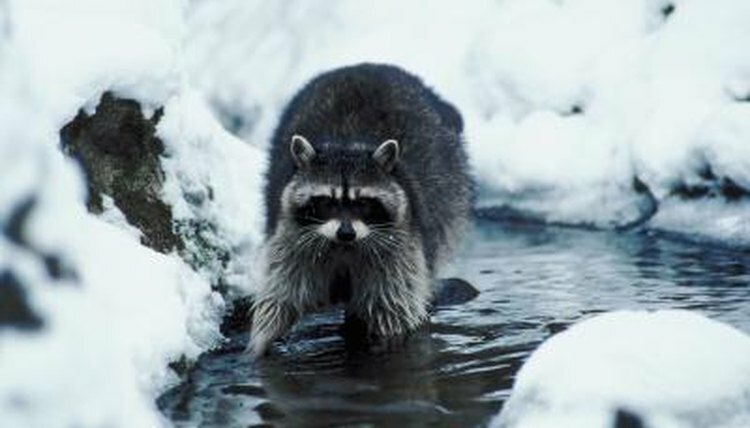 Torpor will last longer for raccoons in colder climates, while those in warmer southern climes may never enter the state. In addition to increased fat stores, raccoons grow a thicker coat of fur to help insulate them in the winter. The fur traps body heat close to the skin and helps keep them warm both in their dens and outside. The animals in colder climates will grow thicker coats in proportion to the severity of the winter. The combination of physical adaptations and behavioral changes help raccoons prosper even in harsh winter months.